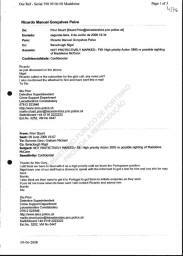 Table of Contents : Processo Vol 16..(PDF pages-245-248 )...pages 4376 to 4379-"Email from Stuart Prior to PJ re: possible sighting in Sussex"
Subject : FW : High priority Action 3895 re possible sighting of Madeleine McCann. as just discussed on the phone. 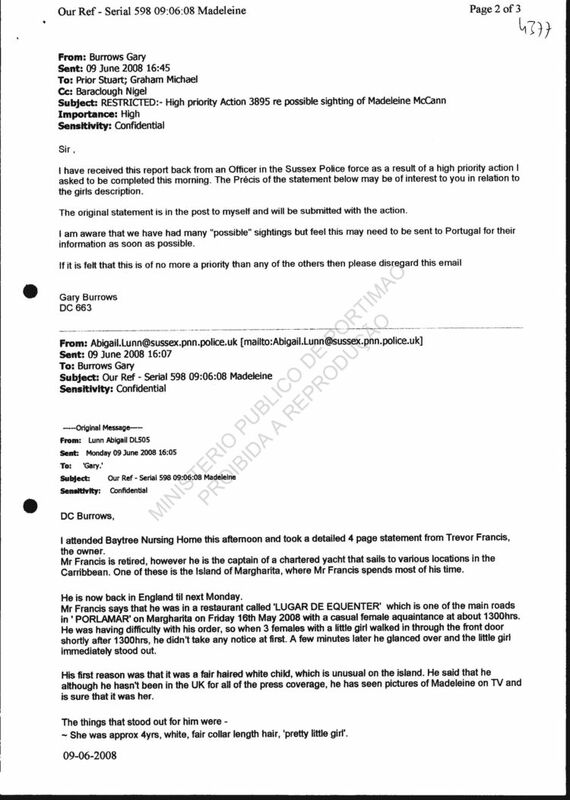 Ricardo called in re the subscriber for the girl's call, any news yet ? I still think we have to deal with it as a high priority until we know the Portuguese position. 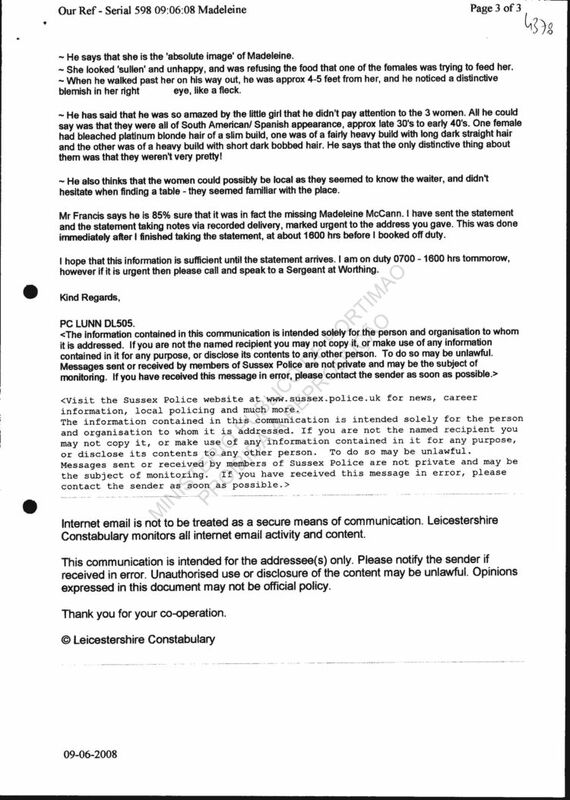 Nigel, have one of our staff had a chance to speak with the informant to get a feel for him and any info he may have ? I also think we then need to get it to Portugal to get them to initiate enquiries as they wish. 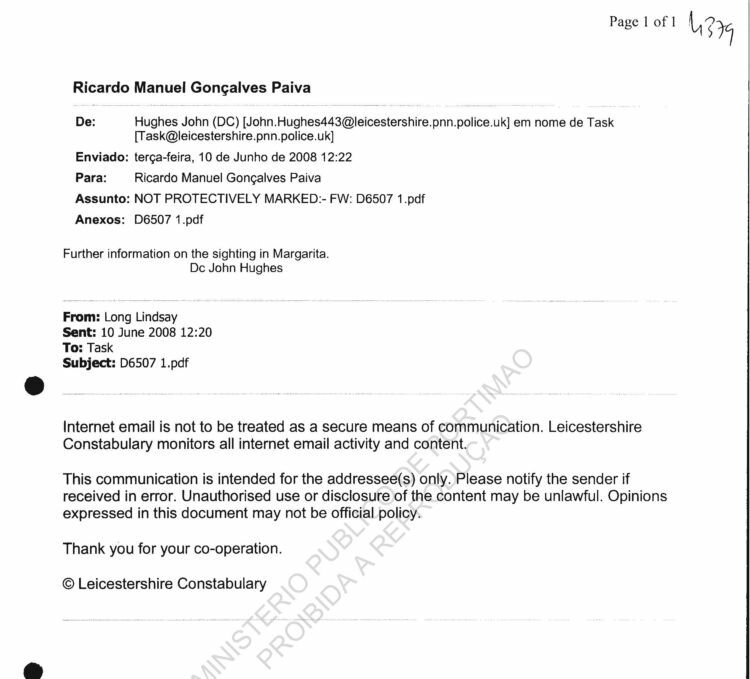 If you let me know when its been sent I will contact Ricardo and advise him. 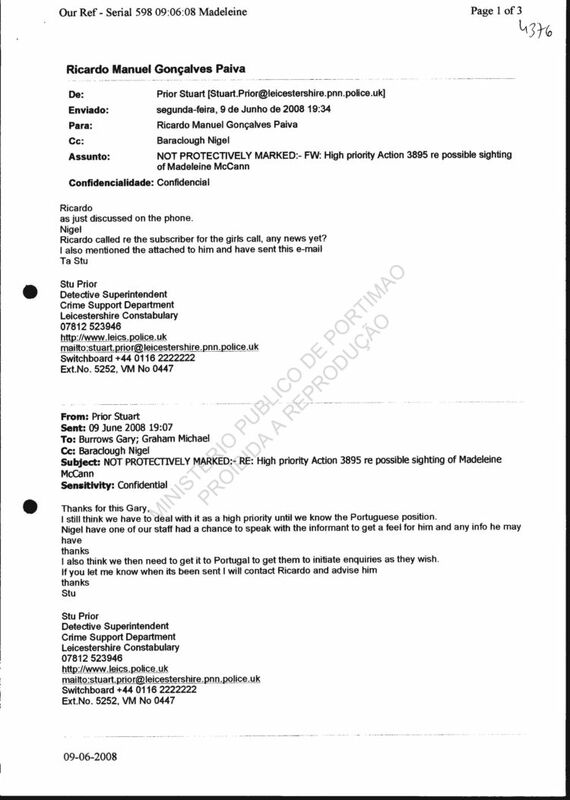 Subject : RESTRICTED : - High priority Action 3895 re possible sighting of Madeleine McCann. 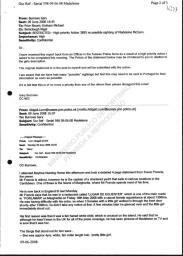 I have received this report back from an Officer in the Sussex Police Force as a result of a high priority action I asked to be completed this morning. The precis of the statement below may be of interest to you in relation to the girl's description. The original statement is in the post to myself and will be submitted with the action. I am aware that we have had many "possible" sightings but feel this may need to be sent to Portugal for their information as soon as possible. If it is felt that this is of no more a priority than any of the others then please disregard this e-mail. 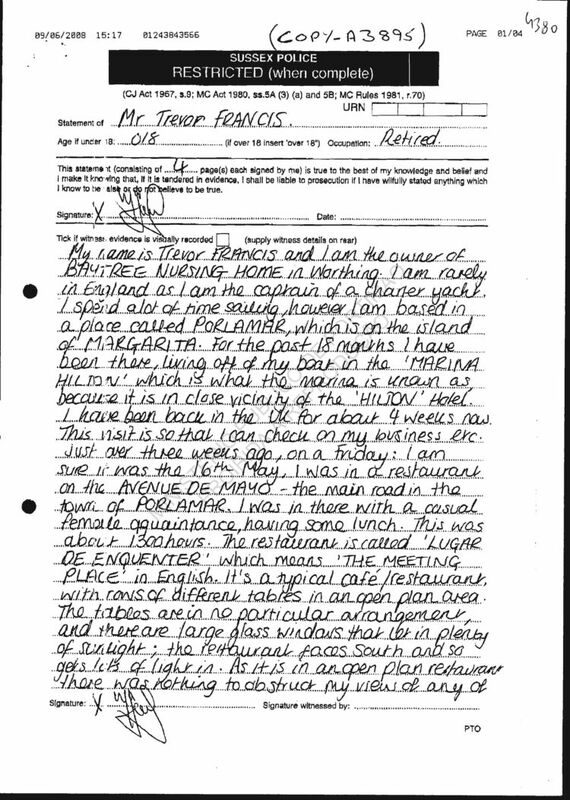 I attended Baytree Nusring Home this afternoon and took a detailed 4 page statement from Trevor Francis, the owner. Mr Francis is retired, however he is the Captain of a Charted Yacht that sails to various locations in the Carribbean. One of these is the Island of Margharita, where Mr Francis spends most of his time. He is now back in England til next Monday. Mr Francis says that he was in a restaurant called "LUGAR DE EQUENTER", which is (on, (sic)) one of the main roads in "PORLAMAR" on Margharita, on Friday 16th May 2008 with a casual female aquaintance at about 1300hrs. He was having difficulty with his order, so when 3 females with a little girl walked in through the front door shortly after 1300hrs, he didn't take any notice at first. A few minutes later he glanced over and the little girl immediately stood out. His first reason was that it was a fair haired white child, which is unusual on the Island. He said that, although he hasn't been in the UK for all of the Press coverage, he has seen pictures of Madeleine on TV and is sure that it was her. - She was approx 4yrs, white, fair collar-length hair, "pretty little girl". - He says that she is the 'absolute image' of Madeleine. - She looked 'sullen' and unhappy, and was refusing the food that one of the females was trying to feed her. - When he walked past her on his way out, he was approx 4-5 feet from her, and he noticed a distinctive blemish in her right eye, like a fleck. - He has said that he was so amazed by the little girl that he didn't pay any attention to the 3 women. All he could say was that they were all of South American/Spanish appearance, approx late 30's to early 40's. One female had bleached platinum blonde hair, of slim build, one was of a fairly heavy build with long dark straight hair and the other was of a heavy build with short dark bobbed hair. He says that the only distinctive thing about them was that they weren't very pretty ! - He also thinks that the women could possibly be local as they seemed to know the waiter, and didn't hesitate when finding a table - they seemed familiar with the place. Mr Francis says he is 85% sure that it was in fact the missing Madeleine McCann. 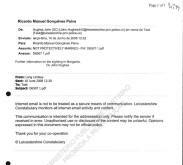 I have sent the statement and the statement taking notes via recorded delivery, marked urgent to the address you gave. This was done immediately after I finished taking the statement, at about 1600hrs before I booked off duty. I hope that this information is sufficient until the statement arrives. I am on duty 0700-1600 hrs tomorrow, however if it is urgent then please call and speak to a Sergeant at Worthing. Further information on the sighting in Margarita. 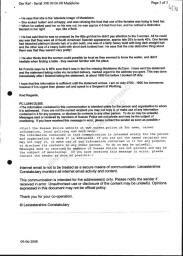 Table of Contents : Processo Vol 16..(PDF pages 249-252)...Pages 4380 to 4383-"Witness statement of Trevor Francis (English)"
Age if under 18...018....(if over 18 insert 'over 18') Occupation : Retired. 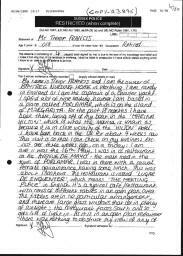 This statement (consisting of....4....page(s) each signed by me) is true to the best of my knowledge and belief and I make it knowing that, if it is tendered in evidence, I shall be liable to prosecution if I have wilfully stated anything which I know to be false or do not believe to be true. the other people in the restaurant. There were a few people in the restaurant. Just after about 1300hrs, the door opened and three females with a little girl came in. They sat down at a table opposite me, about 20 feet away from me. There were two tables between us, with one person at each, but they did not obstruct my view of their table. At first I did not take any notice because I was having trouble with my food - I had to send it back and the drinks were taking too long. Once I had sorted out my order, I glanced back at the table with the women and the small girl. I noticed that the little girl was white, with fair hair. There are sometimes white children in Venezuala, but not as fair as this child. She really stood out. I was transfixed. She was the absolute image of the missing Madeleine MC'CANN, with chin length straight fair hair, about 4 years old, a pretty little girl. What I noticed most prominently were her eyes - they were big and staring. Lots of things went through my mind - I wanted to jump up and grab her or shout out her name and see what reaction I would get from the girl. However I was afraid to do anything and cause a scene, as a huge raucous would have erupted, and it could have made things worse. Venezualan Police are not very helpful to foreigners and are very corrupt. I decided to get a good look to make sure it was her so I could come back to ENGLAND and reprt it. I shuffled in my seat so I could see 'Madeleine' clearly. The little girl sat facing me, with a female either side of her and one sitting on the opposite side, but not directly in front of the girl, so I could see her well. 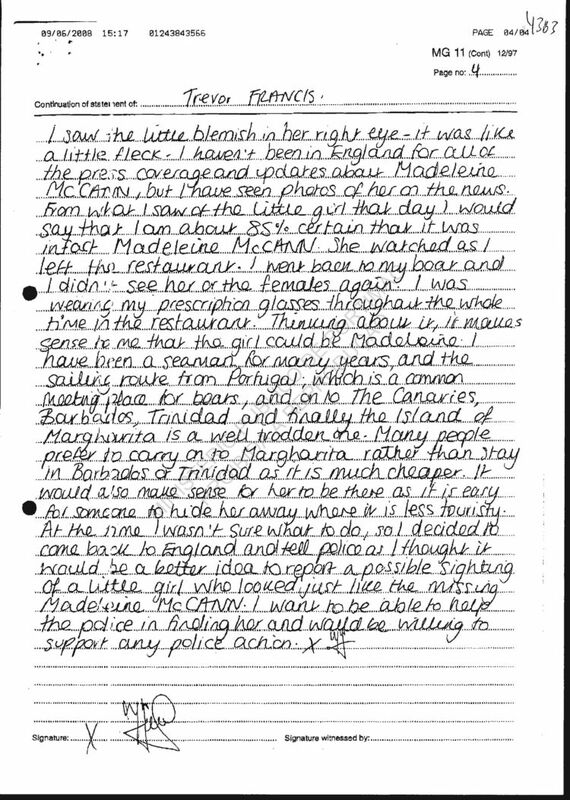 I saw the little blemish in her right eye - it was like a little fleck - I haven't been in England for all of the press coverage and updates about Madeleine MCCANN, but I have seen photos of her on the news. From what I saw of the little girl that day I would say that I am about 85% certain that it was in fact Madeleine McCANN, She watched as I left the restaurant. I went back to my boat and I didn't see her or the females again. I was wearing my prescription glasses throughout the whole time in the restaurant. Thinking about it, it makes sense to me that the girl could be Madeleine. I have been a seaman for many years and the sailing route from Portugal ; which is a common meeting place for boats, and on to the Canaries, Barbados, Trinidad and finally the Island of Margharita is a very well trodden one. Many people prefer to carry on to Margharita rather than stay in Barbados or Trinidad as it is much cheaper. It would also make sense for her to be there as it is easy for someone to hide her away where it is less touristy. At the time I wasn't sure what to do, so I decided to come back to England and tell police as I thought it would be a better idea to report a possible sighting of a little girl who looked just like the missing Madeleine McCANN. I want to be able to help the police in finding her and would be willing to support any police action.